One of the first assignments we had for 501 was to manipulate images in the style of Shepard Fairey. The assignment was to use a political figure, and I chose a few – the iPhone, and Steve Jobs. The controversy surrounding Foxconn had been on my radar for some time, but around the time this assignment was assigned (February 2012), I noticed an increased awareness of this issue. For this image, I used two political figures – Steve Jobs and the iPhone. I picked these to make a commentary about the egregious working conditions at Foxconn, the factory that manufactures Apple products. At first, I started with just the iPhone image, with the intention of making the iPhone the “political figure” from the prompt, but since the death of Steve Jobs, many have criticized him, subverting his postmortem glorification by pointing out some of the dirtier parts of his decisions that get swept under the rug. Hence, I added an image of Steve Jobs as a sort of puppetmaster pulling the strings of death for the suicidal Chinese worker. Moreover, I think it is hard to talk about Apple and its relationship with Foxconn without thinking about Jobs’ role in it, or the decision to turn a blind eye. 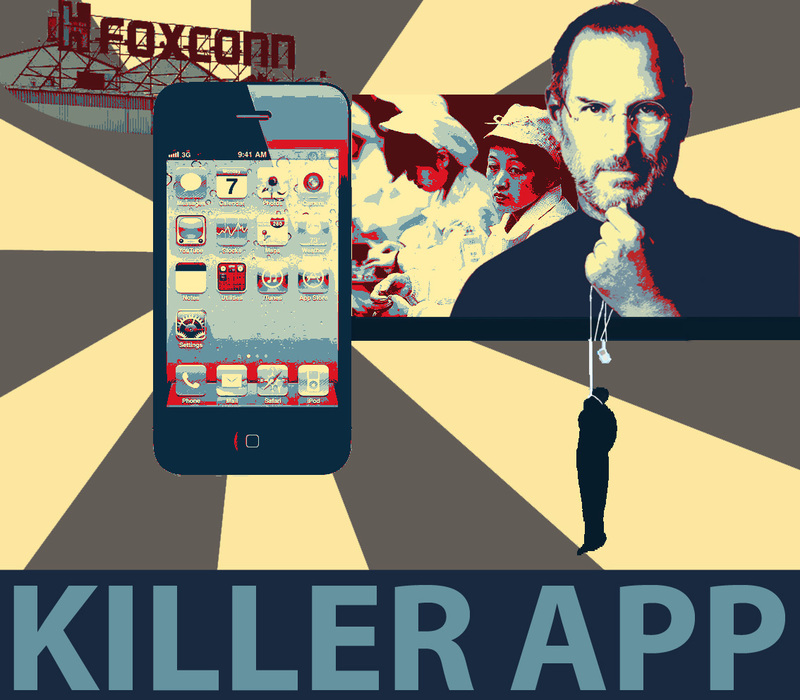 “Killer App” has a few different meanings. On one hand, “killer app” has often been used to describe a popular Apple application – indeed, a game changer, and many applications in the Apple Store describe themselves as such. On another level, it points to the application process that the workers at Foxconn go through in order to get a job that may end up killing them physically (suicide or otherwise). And finally, the “killer” part of the text also points to the dehumanization of the manufacturing process. With “kill” being an action to cease life, I hope people will take it a step further to interpret it as stripping a human of their humanity for the capitalistic gains of a dominant empowered entity – in this case, Apple. While I intended to use this image to criticize Apple’s device manufacturing decisions while acknowledging that Steve Jobs had been villainized for turning the blind eye to the conditions in Foxconn, this article reminds us that we who have smartphones also add to the impetus of Apple to look for cheaper and cheaper ways to manufacture phones. However, I still maintain that Apple is ultimately the one in power to make decisions regarding its device manufacturing, and the only thing they see is their bottom line, not the dehumanized workers treated like machines and worked until they drop.